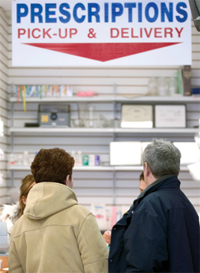 The Healthcare Compliance Packaging Council (HCPC) is a not-for-profit trade association that was established in 1990 to promote the many benefits of unit dose packaging-especially the fact that these formats can be designed with compliance-prompting features proven to help people take their medications properly. Better packaging can help! Unit dose packaging can be designed in compliance-enhancing formats that remind people whether they have taken their medications. Birth control pills, certain antibiotics, hormone replacement therapies, and steroids are already being dispensed in unit dose packaging that has proven highly effective in helping people manage their pharmaceutical regimens. The HCPC strongly believes that if more products were packaged in a unit dose format, the noncompliance problem would be greatly reduced. While insurance companies and managed care organizations bear the greatest economic burden from pharmaceutical noncompliance, everyone must also pay a share in the form of higher taxes, premiums, and lost productivity. That is why the HCPC’s goal is to inform and educate consumers, health professionals and policy makers about the role that unit dose packaging can play in improving pharmaceutical compliance. We are working for the day that consumers will have a choice when they get their prescriptions filled-either the standard cap and vial format that does nothing to help them manage their medications, or a compliance-style, unit dose package that will help ensure that they actually take the medication as it has been prescribed.